Call it happenstance ; call it a strange coincidence : the past few days for no known reason, my mother has been constantly in my thoughts. And then the realisation. Twenty five years ago, on this month, on the 8th of July my mother had gone to consult the doctor for her chronic pain in the leg – a legacy from an ill fated tonga ride in Agra from decades ago. Temporary relief from the excruciating pain was all she hoped for. While conducting his usual examination, the doctor was alarmed when he noticed abnormal palpitations in her heart, and immediately sent for the nurse to conduct further tests. Right on the examination table, my mother suffered a massive heart attack and collapsed in a heap. All emergency measures to resuscitate her failed, and she was pronounced dead. It all happened in a flash that she might not have had time to ponder on the fact that instead of getting minor relief from pain that she had sought, the good Lord had chosen to relieve her of the greater pain of life. She was just 63, was very active taking care of two school going grandchildren, cooking for the family, literally seeing to it that everything was in order and the household ran to clockwork precision. Although she would voice her discomfort off and on, nobody really paid any serious attention to the problems faced by her both physically and mentally. 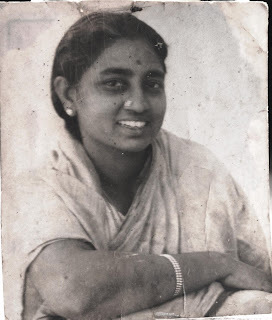 She wanted to do so many things in her life, see so much of the world, experience things outside the ordinary and the drudgery of the daily grind : but the pressures of the family tied her down to the small, dingy two bed room apartment in Besant Nagar, Madras. My father too was a very family oriented person but in a different sort of way with no interest in things that mattered to my mother, or indeed other members of the family : his idea of family and the good life were diametrically opposite to those of his immediate kin. He frequently chided my mother for harbouring such “outlandish” desires, when her priorities should be - husband, children and grandchildren in that order. In the event, she had to perforce curb her desires and lead the kind of life she was absolutely not interested in, bordering on the loathsome. choice, but no : even if she went to visit somebody or to stay in her relative’s house, my father would insist that they take one / two grandchildren along. That too, on his scooter which my mother hated with all her heart. She loved her grand children alright, but that did not mean she wanted them to tag along wherever she went. My parents used to end up fighting all the time on this account, and since my father was and is very domineering, my mother would eventually have to give in, every time. My parents went to the US in the year 1990 for the first time to visit my sister in Boston. Despite strong and vocal protests from my sister and my mother as well, my father insisted on taking his 9 year old grandson along on the foreign jaunt. My mother and my sister, both poor things had to put up with my father’s stubborn pig headed ways, his whims and fancies. She always used to say, she was blessed with very good in laws, and it was my father instead, who was the real tyrant, the ogre causing all the trouble, trauma and misery. Although my parents were first cousins who happened to get married, they could barely get along : if my mother went right, my father would always go left - they could never see eye to eye on any matter of importance. Because my mother was not working or having her own income, she was forced to lead a submissive life with him. She loved him for the few brief flashes of goodness in him, but he never loved her the way she wanted to be loved by him. I am sure it is the same story in many families of that era. One had to live a life resigned to one’s fate. Coming to the point of my remembering her, I feel we too, as daughters were not very sensitive to her needs and her pain for we were too busy with our own little family and our children, we were so involved in deciphering our lives, that somehow her problems were not so much of a concern for us at that point in our lives. Now looking back, I feel so guilty of not understanding her problems and not having offered her any succour. Of course we used to fight with our father to take good care of her, take her out, take her to places she wanted to visit, take her to a good doctor, and make her life more enjoyable, but it had no effect on him, he never changed, and he has remained that way to this day. Now, when I think of all the illness she suffered through silently both physical and mental, I wish I had the determination to bring her forcibly to our home and showed her to a good doctor. She did come to our home in Bangalore a couple of weeks before her death to visit me ( and my nephew along with her) for a brief visit of only 10 days. I was so happy to see her, and she was shocked to see me with a bob cut : she couldn't believe I had the guts or the heart to cut off my long wavy hair. Soon we were chatting all day, and I asked her where she would like to go etc. For which she told me she wanted to just visit all her close relatives, her cousins, her very dear sister, and her friends whom she had not met in a long while. We took her everywhere she wished to go, my husband playing the ever obliging chauffeur ( in those days he was mostly jobless at home), and we were so happy to see her so happy and the people she met also were so happy to see her. We took her to one of those exhibitions with Ferris wheel and other attractions on the RBANM School grounds in Ulsoor, where she had lots of her favourite ice cream, chilli bajji, paani puri and pink gossamer cotton candy. The child in her could not to be repressed on this wonderful day. We gorged shamelessly on all kinds of street food she loved to eat. She thoroughly enjoyed herself. Not even the severe indigestion we feared we might suffer the next day took away the delight from my mother’s face. The memory of that wonderful and carefree evening I spent with my dear mother still brings tears of joy from my eyes. She taught me all the dishes which I wanted to learn from her. She had plenty of rest, away from the really tiring and tension filled life she was leading in Madras with my father, my brother and his family. The Bangalore weather also was much enjoyed by her as it was cool as heaven compared to the furnace called Madras. However, I noticed she would go off to sleep very often, and I attributed it to her having no worries or tension, and did not bother her as I too was happy she was finally able to rest peacefully. Once or twice she would ask for some Crocin saying she was feeling a little feverish, and when I suggested we visit a doctor she refused saying it was just a mild fever, which the trusty Crocin would take care of. My mother got her menopause pretty late in life, and she must have gone through a lot of pre-menopausal symptoms, with its attendant aches and pains, hot flashes : her leg pain could have been aggravated because of the havoc that the hormones tend to play at that time, plus the irritating life she was leading with my father. Now when I think about all those things, I wonder how my mother managed to live through it all. Around that time also she had the cataract operated upon in one eye : in those days only one eye at a time was the norm. Not having any domestic help, she had to immediately get down to the daily household chores, work in the heat of the kitchen etc. The healing of the eye over, she was forced to wear thick glasses prescribed by the doctor. She hated glasses as they made her very uncomfortable, but she wore them nevertheless. Soon enough, she had to undergo the trauma of surgery on the other eye as well. How she would have loved to travel carefree to all the parts of world, and in India too, she wanted to see so many places. She was a voracious reader: she used to love novels like Perry Mason, James Hadley Chase, Georgette Heyer, and all the M&B offerings she could lay her hands on. Romantic novels in Tamil too were her favourites. Despite her multifarious problems, she always wore a smile on her face. She had no interest in decking herself with jewels : she always wore a seven diamond studded nose ring called Besari and the traditional 7 diamond studded earrings, and her Kodi and the yellow thread round her neck. She had sacrificed so much in her life bringing us up, taking care of each and every need of ours, supporting us and shielding us from the wrath of our father when we did things that might have angered him. Mother you were too good for us – sometimes I feel we didn't deserve you, and when you are no longer here, we think of you often, though now it is too late to do anything about it. Time is like a river that never stays still, but keeps flowing, and you have flown like the river, leaving us behind to stagnate in our guilt. Today when my leg pains sometimes, my thoughts immediately go back to you ; when I go through menopause, I think of you ; when I am in comfort, I think of you ; when I see how loving and caring my husband and my children are, I think of you. I don't need a mother's day to think of you, since you are in my thoughts all the time. Mother, I pray everyday for you, I am sure you are in a place where you are absolutely happy, healthy and fine. My only advice to people who still have their parents, to think of their happiness and try to spend as much quality time with them, and never take them for granted. Rama di...my heart is with you as I read this post.How I miss my mom too...working and taking care of my dad and her mom adjusting her desires and wishes to suit their needs and wants , all the sacrifices and compromises she had to do in a joint family to raise me and my brother.I too pray with all my heart and strength that she finds happiness in the little time she could find for herself...wish I could do more for her. Wow.. what a beautifully written post. Your mother sounds amazing and I love all of the ways you've remembered her. Anyone who reads this will feel sentimental for your mother and their own. Lovely. I cannot express more. We sometimes get to have such aching throw back. I do not for a moment think that a father can replace a mother, but a mother can replace a father! You are right, Anil, mothers are always special. Omg! I have no adjectives in my vocab to tag to this post. Extremely beautiful thoughts have been expressed. I know no words in any language can encompass our love for our parents but still you have managed to bring it out beautifully. Yes many women of the older generation must have suffered silently and must have suppressed their ambitions, wishes and desires. Thank you for this beautiful post. Such honesty... I've plans to go spend a few days with my parents as my mother is not doing very well these days. My father said it wasn't necessary, that he was all set. My leg has been hurting and he told me to take care of myself. Such a thoughtful man. But I'd decided to go visit anyway. This post is a reminder of how fleeting life can be. I will certainly go through with my original plan to visit. Thank you again for the precious reminder. I am glad my blog has made to you stick to your original plan of visiting your mother. I am sure, your father must be looking after her well, but seeing you and spending time with you would definitely make her feel much better, and you too would not regret it. Have a great time with your parents! Such a heartfelt post, Rama! Moms are like this, so caring and loving and non-demanding. We realize the gravity of the contribution they make to our lives only when they are gone. I miss my mother terribly too though my dad was really very very devoted to her yet I wish that I could have done more for her. I can see that you do resemble your mom. Take care. I do not know what to call it. A requiem or a tribute. I am very much moved to read all that you had to say about your mom. Let her soul rest in peace. Dear Rama, I understand you so well as I lived together with my mom all my life long, never parted even for short times, besides my work duties. Even vacations we brought together when she was still alive. There are 8 years since she left us and it seems like an eternity. I miss her everyday, and everyday something brings her in my thoughts. Widowed at 43, she brought up my two children, and was always here for each of us. So, I feel with you at every written word. Let her rest in peace! Beautiful post Rama, I miss my grandpa the same way how you miss your mom. He was very close to me.